One of the least discussed and at the same time most important aspects of this economic crisis is the discrepancy between official inflation measures used by the FED, the Consumer Price Index( CPI) and, specially, Personal Consumer Expenditures (PCE), and the real inflation experienced by real people. One example of this last real inflation is the cost of a breakfast as measured by the Breakfast Beverage Index, that is at its highest level in 2 years. If you want to learn more about how inflation is mismeasured and misrepresented in the USA, visit Shadowstats. On the 100th anniversary of the creation of the Federal Reserve (FED), designed in secrecy by a group of Wall Street bankers and voted into existence by the American Congress on december 23 1913, Ron Paul publishes this article arguing that its creators have succeeded beyond their wildest dreams, and that the FED has taken total control of the american economy, and not for the good. To illustrate Ron Paul’s message we include 2 charts. 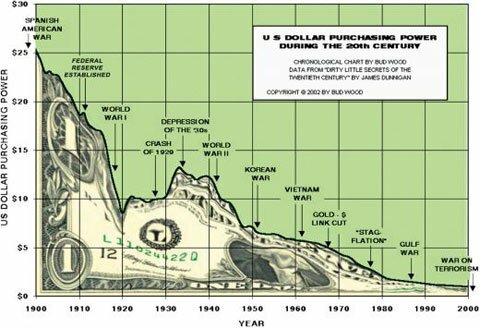 In the first one we can see the loss in purchasing power of the US Dollar from around 1900 until today. 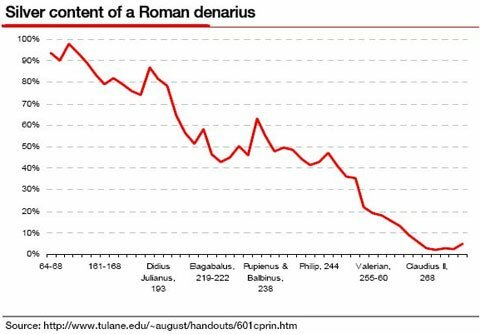 In the second one we can see the percentage silver content in the Roman Denarius from around 180 AD to 280 AD, after the government of the Antonines, when Rome went into rapid decline. After 100 Years Of Failure, It’s Time To End The Fed! A week from now, the Federal Reserve System will celebrate the 100th anniversary of its founding. Resulting from secret negotiations between bankers and politicians at Jekyll Island, the Fed’s creation established a banking cartel and a board of government overseers that has grown ever stronger through the years. One would think this anniversary would elicit some sort of public recognition of the Fed’s growth from a quasi-agent of the Treasury Department intended to provide an elastic currency, to a de facto independent institution that has taken complete control of the economy through its central monetary planning. But just like the Fed’s creation, its 100th anniversary may come and go with only a few passing mentions. Like many other horrible and unconstitutional pieces of legislation, the bill which created the Fed, the Federal Reserve Act, was passed under great pressure on December 23, 1913, in the waning moments before Congress recessed for Christmas with many Members already absent from those final votes. This underhanded method of pressuring Congress with such a deadline to pass the Federal Reserve Act would provide a foreshadowing of the Fed’s insidious effects on the US economy—with actions performed without transparency. Ostensibly formed with the goal of preventing financial crises such as the Panic of 1907, the Fed has become increasingly powerful over the years. Rather than preventing financial crises, however, the Fed has constantly caused new ones. Barely a few years after its inception, the Fed’s inflationary monetary policy to help fund World War I led to the Depression of 1920. After the economy bounced back from that episode, a further injection of easy money and credit by the Fed led to the Roaring Twenties and to the Great Depression, the worst economic crisis in American history. But even though the Fed continued to make the same mistakes over and over again, no one in Washington ever questioned the wisdom of having a central bank. Instead, after each episode the Fed was given more and more power over the economy. Even though the Fed had brought about the stagflation of the 1970s, Congress decided to formally task the Federal Reserve in 1978 with maintaining full employment and stable prices, combined with constantly adding horrendously harmful regulations. Talk about putting the inmates in charge of the asylum! Now we are reaping the noxious effects of a century of loose monetary policy, as our economy remains mired in mediocrity and utterly dependent on a stream of easy money from the central bank. A century ago, politicians failed to understand that the financial panics of the 19th century were caused by collusion between government and the banking sector. The government’s growing monopoly on money creation, high barriers to entry into banking to protect politically favored incumbents, and favored treatment for government debt combined to create a rickety, panic-prone banking system. Had legislators known then what we know now, we could hope that they never would have established the Federal Reserve System. Today, however, we do know better. We know that the Federal Reserve continues to strengthen the collusion between banks and politicians. We know that the Fed’s inflationary monetary policy continues to reap profits for Wall Street while impoverishing Main Street. And we know that the current monetary regime is teetering on a precipice. One hundred years is long enough. End the Fed. Chris Martenson interviews Jim Rogers, an American investor and author. Rogers is the Chairman of Rogers Holdings and Beeland Interests, Inc. He was the co-founder of the Quantum Fund with George Soros and creator of the Rogers International Commodities Index (RICI). In the interview Jim Rogers draws attention on this unique moment in financial history where most central banks engage in “money printing”, wiping out the western world’s saving class, and creating the foundations for a potentially devastating future. Yesterday, in his biannual testimony to the USA Congress, the president of the Federal Reserve, Ben Bernanke, asserted that inflation under his and Mr. Greenspan’s mandate was no more than 2% a year. While this might be “true” using Bureau of Labor Statistics (BLS) data, please check ShadowStats for a true picture of inflation in the USA. Even using BLS data, it is very informative to check a chart of inflation of the USA from 1775 until 2012. Please note 2 dates: the creation of the Federal Reserve in 1913 and the decoupling of the US Dollar from gold under the Nixon administration in 1971. The enslavement of our children in student loan debt and handing them the bill for $200 trillion of unfunded entitlement liabilities will be the spark that ignites the worst part of this Crisis. 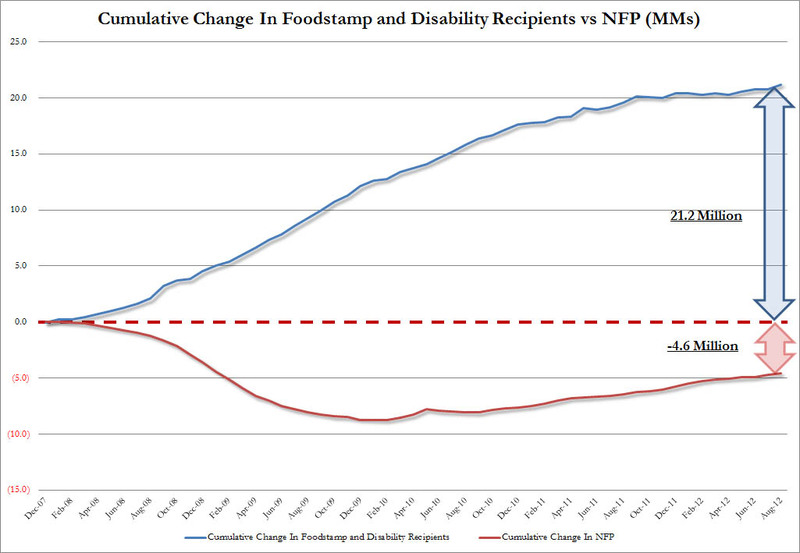 Make nominal spending the new target? We hope not. In the January 2 2013 edition of the Financial Times Mr. Scott Summer, economics professor at Bentley University, publishes an article titled Make nominal spending the new target, where he argues for the revolutionary, and increasingly MSM-pushed idea of making Nominal GDP Targeting (NGDPT) the official policy of central banks in most western countries. This policy was already hinted last December at a conference in Toronto by the present governor of the Bank of Canada (BoC), and future governor of the Bank of England (BoE), Mark Carney. This in an article fraught with ideas that, if implemented, will permanently transform the nature of western economies and pave the way for structurally high inflation, potential hyperinflation, economic misallocation of resources, moral hazard (savers, wage earners and pensioners being punished), and general impoverishment of the population except for the few taking advantage of it thru their access to cheap financing: financial institutions and überwealthy individuals. TYR states: This paragraph foreshadows the huge amounts of half-truths and outright lies that conform the article. It sets the stage for the assertion that a central bank’s main role is to foster “demand”, foster growth. This has never been the role assigned to monetary policy, whose main aim is, and should be, to preserve the purchasing value of the currency, that is , to keep inflation low. By positing that central banks should aim at fostering demand, the author conveniently ignores the fact that nominal GDP growth comes at the expense of inflation, that by debasing the currency in order to reach a theoretical NGDP target, no real growth is achieved, only the appearance of it, since that growth is basically inflation. This has been well-known since roman emperors clipped their silver coins. A not so obvious harm that such a policy would cause is a further misallocation of resources in the economy. By artificially fostering some sectors of the economy that depend on cheap financing (finance, housing) thru monetary policy, the same misallocation that was an important cause of the 2008 crisis is being perpetuated. Mr. Scott Summer states: “Inflation targeting failed in two ways. First, it was a poor indicator of the adequacy of aggregate demand. Second, it is susceptible to “liquidity traps”, a period of near zero interest rates where central banks’ favourite tool – interest rate targeting – is rendered ineffective”. TYR states: Inflation targeting was never intended to be an indicator of aggregate demand, but a (bad) tool to control inflation, the main aim of the guardians of the currency, central banks. Liquidity traps, a Keynesian and non-scientific term, is not caused by inflation targeting, but by debt overhangs, resulting in crisis, like the one in 2008, originated in previous monetary laxity, precisely what the author recommends as future policy. TYR states: The author ignores the reasons behind the weakness in the economy, too much debt and misallocation of resources in the economy with some sectors overrepresented, housing and finance. 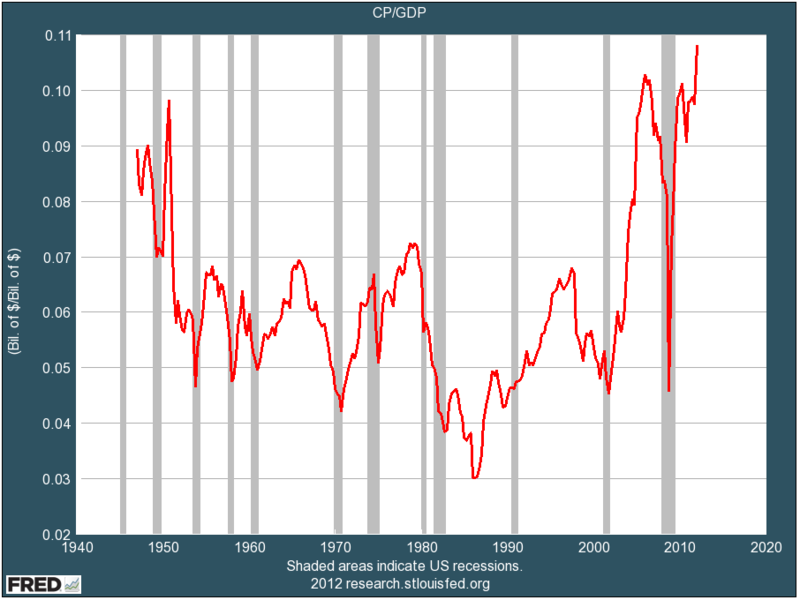 TYR states: It is a huge mistake to assume that there is a “natural” nominal GDP growth rate, where is the scientific proof for this assumption? For centuries, GDP growth was very low, until the First Industrial Revolution speeded it up. What does that have to do with monetary policy? GDP growth depends basically on population growth and productivity, and productivity depends on availability of resources, capital and technological innovation, none of which are by any means affected by monetary policy. TYR states: Do we have to conclude that the inflated asset prices of 2008 should have been allowed to remain inflated for the sake of mantaining an arbitrarily determined nominal GDP level? In what way is this different from a centrally planned, fascist-soviet economy? What role does the cleansing mechanishm of failure have under such an economic system? This is certainly not capitalism. TYR states: Wages do not necessarily follow growth in national income. This has not been the fact in the last 40 years where wages have reduced their share as a percentage of GDP from 53% to 44%. It is corporate profits that have benefited the most from the covert inflation we’ve had since the USA dollar was unlinked from gold in 1971. But even if the author was right in this assumption, assume for example that we have a NGDP growth rate of 5%, an inflation rate of 5% and a wage growth of 5%…do we have any real GDP or income growth at all? No. TYR states: Here the author assumes that failed companies will be bailed out (moral hazard and misallocation of resources again) and that there will be fiscal prudence just because some mumbo-jumbo cost benefit analysis will conclude that any further spending does not contribute to nominal GDP growth. Central planning, covert economic fascism again. Finally, the author seems to assume that by central banks financing government deficits “countries will be able to address the public debt problem, as they should, without fear that austerity will cost jobs.”. Does anybody believe that by making deficits immune to their collateral negative effects, increase in interest rates and the associated recession, government deficits will be tackled? Why Reported Inflation Seems Different Than Reality @ StreetTalkLive In this article Lance Roberts explains clearly how and why reported inflation understates real inflation, by a wide margin, and how this is one of the main factors contributing to the ongoing reduction in the standard of living in America. Amazing Chi Energy “Iron Shirt” Demonstrations @ Washington’s Blog yes, amazing. Is the SNB on New York’s leash?